We do not accept groups (groups are consider from 5 and or more) with separate reservations, they have to book the full room though. We reserve the right of admission for any group that does not meet the requirements, the reservation will be canceled without refund. Group reservations are no refundable, The total value of the reservation will be automatically charged on the card to ensure the reservation of the group. group reservations can not be canceled less than one month before arrival. Must pay the full room although the number of people is less than the amount of beds in the dorm. Any group booking made with several names will be canceled as the group booking regulations of the hostel will be violated. Any reservation that does not comply with the regulations will be canceled without refund. 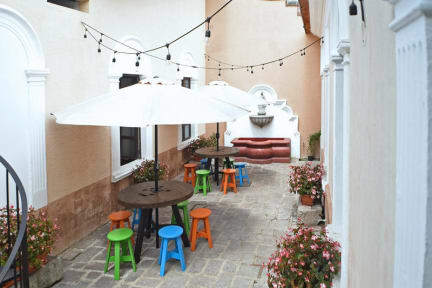 Cucuruchos Boutique Hostel is a friendly new hostel in Antigua. We travel, some of us forever, to seek other hostels, other backpackers, other brews, Antigua- Guatemala. Cucuruchos Boutique Hostel is ideally located in the city, near the Santa Catalina Arch and around 22 km away from the closest Airport, La Aurora International Airport. For your comfort, there is a shared kitchen at the property. 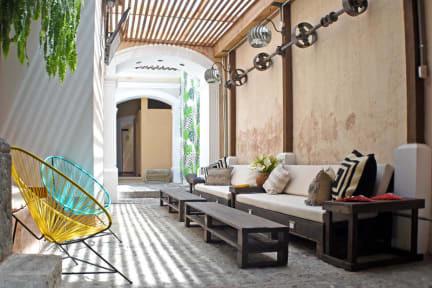 Cucuruchos Boutique Hostel is located in Antigua Guatemala, 500 metres from Santa Catalina Arch. La Aurora International Airport is 22 km from the property. The hostel is ideally located for a great stay in Antigua. The hostel offers comfortable beds. The bedroom has single bunk beds each with a curtain, a personal light, a plug, a fan and a hanger. Check in is at 2 pm. Payment types accepted at this property ONLY cash. Groups of 5 or more people( even with separate reservations) will need to book the entire room, even if the number of people is less than the amount of beds in the dorm. We reserve the right of admission for any group that does not meet the requirements. Any reservation that does not comply with the regulations will be cancelled without a refund. A security deposit will be charged at the check in and returned at check out. The cost of any damages will be deducted from the deposit. Check in is at 2 pm. We keep reservations until 5 pm, unless your email states you're arriving at a different time. Great hostel! The staff is friendly & professional and will make you feel at home. The cleaning services are excellent, the entire hostel is cleaned daily. The breakfast buffet is great as it caters to everyone's needs. Also the rooftop is amazing, from there you can see all three volcanoes! Geweldig hostel met alle nodige faciliteiten! Mooie ruime keuken, super dakterras, locatie top. Hebben genoten van ons verblijf! Nice place, although I only stayed one night. The breakfast was good, good facilities and nice people. Luxurous hostel. Very comfortable beds and they have good included breakfast! Stay here! Its a lovely place with a good location, rooms are quite private because the have a curtain. The place is super clean and they have the best staff. Big thanks to Gaby who is always there for you but the rest of the staff is also so helpfull. Great place in the centre of Antigua. Nice volcano views and amazing breakfast!! Very nice hostel, clean, the bunks are great and private, staff super helpful, okay breakfast. Shower a bit small. Very nice and clean hostel with attention for detail and a luxurious ‘look and feel’. Amazing breakfast. Spotless cleaning. What I didn’t like about it were the 3-story beds and the bathrooms are very small. It’s more of a place to go with friends or to relax, not a super social place for the solo traveler. If you want peace and quite, a great bed and a cleaning lady that folds all the items you leave on it; go here! We had a nice stay at Cucuruchos. The place is really nicely decorated, the breakfast is great and dorms have nice curtains to make it more private.